Chances are that America’s most recent health trend is one you were given as a child. Think back to when you were ill, what was the one of the first things your mother made to help you feel better? That’s right, hot soup. That savory tonic infused with fresh vegetables and herbs really does do a body good. In fact, it’s backed by science. Specifically, bone broth inhibits neutrophil migration. That is, it helps to lessen the side effects of colds, flu and upper respiratory infections. Medical experts point out that broth helps to kick start your immune system through the slow cooking process. The process of slowly simmering bones for up to a period of 24 hours causes the bones and ligaments to release healing compounds such as collagen, essential amino acids such as, proline, glycine, and glutamine that have the power to transform your health, heal and calm. Further, the minerals and the marrow helps build blood cells, which is the healing mechanism in the body. When vegetables are added to the broth, they release dense nutrients, antibiotic and antiviral properties to the liquid. Collagen – The collagen and gelatin in bone broth support hair growth, skin regeneration and assists in keeping your nails strong. Glutamine – A natural remedy for the leaky gut syndrome. Glycine – Supports digestion and the secretion of gastric acids. As well, glycine naturally detoxifies the body. Proline – Supports good skin health. Gelatin – Supports digestive health, protects and heals the mucosal lining of the digestive tract and assists the digestion of nutrients. This really helps those with a leaky gut syndrome. Bone Marrow – Nutritionally dense and boosts the immune system. Minerals – Bones from land animals are rich in calcium, magnesium, potassium, and phosphorus, and fish bones also contain iodine. These minerals are essential in helping our bones grow and repair themselves. 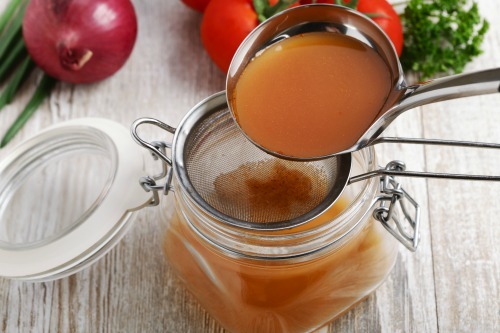 Dozens of scientific studies back the attention that bone broth is receiving. Kaayla T. Daniel, PhD, a nutrition scientist, certified clinical nutritionist, and co-author of Nourishing Broths says, “We have science that supports the use of cartilage, gelatin, and other components found in homemade bone broth to prevent and sometimes even reverse osteoarthritis, osteoporosis, digestive distress, autoimmune disorders, and even cancer,” she says. Concentrating on adding foods that possess immune boosting properties will give your broth more immune boosting power! Try and keep your broth as healthy as possible. Therefore, try and use only organic vegetables. Mushrooms – Mushrooms contain a variety of active compounds, including polysaccharides, glycoproteins, ergosterols, triterpenes, and antibiotics. Carrots – Beta-carotene is converted into vitamin A during digestion. Carrots also contain fiber, vitamin K, potassium, folate, manganese, phosphorous, magnesium, vitamin E and zinc. Interestingly, one study found that cooked carrots had higher levels of beta-carotene and phenolic acids than raw carrots, and the antioxidant activity continued to increase over a period of four weeks. Garlic – One of the worlds healthiest foods – fresh garlic has antibacterial, antiviral and anti-fungal agents. Celery – Celery is a rich source of antioxidants and flavonoids, which studies have shown lowers inflammation as well as the risk of heart disease, enhances the immune system, and inhibits the growth of cancer-causing cells. Beets – I add beets to my beef stock for the rich color it gives and for its health properties. The nitrates in beets are converted into nitric oxide which helps to relax and dilate your blood vessels, improving blood flow and lowering blood pressure. Ginger – I haven’t done this yet, but some swear by adding a tablespoon or two of fresh ginger to their broth to boost the healing properties. It would make a good addition considering ginger is full of powerful antibacterial, antiviral, antifungal, antiparasitic agents. Further, when making bone broth from beef or lamb, the flavor of the broth is improved if you slow roast the bones before adding them to make broth. After we have a chicken dinner, I use the carcass to make broth with. Place all ingredients in a stock pot or crock pot. Slowly bring to a boil; reduce heat. Cover and simmer for an additional 2 hours. Strain broth, discarding vegetables and seasonings. Heat oven to 350 degrees F. Place bones in a roasting pan or on a large rimmed baking sheet. Drizzle with olive oil, turning to coat, then brush all over with tomato paste. Roast until browned, 30 to 35 minutes. Put roasted bones in a 12-quart stock pot or crockpot and add vinegar and enough cold water to cover by 3 inches (about 6 quarts). Bring to a boil, then reduce to a low simmer, uncovered, for 2 to 3 hours. While simmering, occasionally skim fat and foam from the top using a ladle. Add all the remaining ingredients. Continue to simmer, uncovered, for a minimum of 3 hours. *If using knucklebones, simmer overnight, 9 to 15 hours, so the knucklebones have sufficient time to break down. Remove meat and bones with a slotted spoon or tongs; reserve meat for another use. Pour broth through a fine-mesh strainer into a large heatproof bowl. Once the broth has cooled, store in the refrigerator in an airtight container. Bone broths are more than a fad – they are time tested solutions to boosting your immunity. Try these recipes today and start enjoying the health benefits from this ancient diet food. You mention beef in the beef broth but you don’t say how much beef to put in. Thanks, Terry. That was a mistake on my part and has been corrected in the article. When I make beef broth, I typically only use the bones.